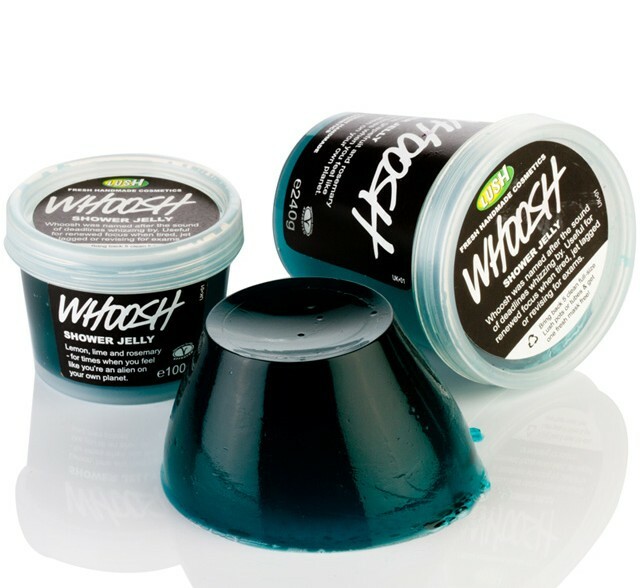 Made of vegetarian jelly, Whoosh is one of three scents in Lush's line of Shower Jellies. I had Whoosh in my "to try" box for a while before braving it as I honestly didn't know what to expect. I remembered that Lush used to sell their Shower Jellies as individual portions in ice cube bags so I had the impression that they were intended to be used as frozen cubes. Whilst the Shower Jelly can be frozen or chilled, it's also possible to use it at room temperature (as I did) and it will retain its wobbly consistency. Whoosh is presented in a screw top plastic tub from which you scoop out the bright blue jelly. The second that I opened the tub, I was hit with an amazing, awakening and uplifting citrus scent which comes from the inclusion of fresh organic lemon & lime juices along with grapefruit juice, grapefruit oil, rosemary oil and geranium oil. Whilst I was a little disappointed to note the inclusion of some "nasties" such as parabens and SLS (which tends to dry out my skin), this was offset to an extent by hydrating glycerin and honey water. There is a very slight lather when used in the shower, although I imagine it would produce more bubbles if used in a bath. I really enjoyed using Whoosh and it's definitely the most fun product that I've come across in a while. It's ideal for kids and adults alike. What's more, it lived up to its claims of being awakening- Lush even recommend it when jet-lagged or hungover. My main complaint is that there was quite a lot of wastage as the slippery jelly is so easy to drop in the shower and for this reason, I'd struggle to pay £3.50 for 100g. I'm really pleased that I tried this but it's undoubtedly a gimmick so I'd be unlikely to repurchase it.